It doesn’t take a large natural disaster to cause damage to your property. Floods, fires, and storms happen with little to no warning and the only thing you can control is your response. The longer you wait to take action, the more damage occurs so it’s important to call a qualified disaster restoration company as soon as possible. ServiceMaster Restoration & Cleaning has been providing residential and commercial clients in Crosby, TX with comprehensive disaster restoration services for 25 years. All of our professionals have been certified by the IICRC and trained to offer high quality restoration services that meet the exacting standards set by the ServiceMaster Restore Quality Restoration Vendor Program (SQV). We use only the most advanced cleaning technologies and products available in the industry to guarantee we offer our clients the best service possible. We restore commercial and residential projects of all sizes and are proud to assist the Crosby community in times of need during natural disasters. The Better Business Bureau has recognized us three times with their Award of Excellence and we have also been awarded the Angie’s List Super Service Award. Mold Remediation: Cleaning mold on your own is difficult because it’s dangerous to handle without the proper protective equipment. Equipment used to find mold in hidden places like walls isn’t available to the general public, and if it’s not eradicated in all areas, it will grow back and spread. Not only does mold destroy structural elements and furnishings, but the spores irritate sinuses and lungs and even make allergies worse. ServiceMaster Restoration & Cleaning is certified by the State of Texas to safely provide comprehensive mold remediation, including a complete evaluation of the area, elimination of the mold, and testing to ensure no traces remain. Mold can cause damage to your home and your health. 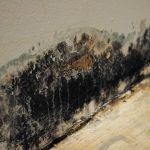 Do you know the financial costs of mold? If you suspect mold in your home, call ServiceMaster Restore. For more information watch the video. Smoke and Odor Remediation: One foul smell can undo the work of thousands of dollars in interior decorating and designing. Even the most expensive air fresheners don’t stand a chance against sewage backups, smoke from a fire, or flooding. Once the smell gets absorbed into the material, it’s almost impossible to remove with commercially available products. The professionals at ServiceMaster Restoration & Cleaning can get the worst smells out of building materials and textiles, saving expensive or cherished items. Our advanced technology and products ensure that your home or business will stay fresh smelling and free of odors. Water Damage Restoration: Finding excess water in your home is always a nasty surprise, no matter the source. Even a small leak from a wall crack during a storm can let in enough water to allow mold to grow. Water won’t go away on its own; it will continue to spread through your home and soak into furnishings. As it spreads, mold will follow. This is why it’s important to call ServiceMaster Restoration & Cleaning any time you see excess water on your property. We have the heavy-duty equipment to remove water quickly and dry the area before mold can grow. If necessary, we can restore and repair any damaged items. Fire Damage Restoration: Fires move dangerously fast, so it’s important to leave immediately at the first sign of one. It’s not safe to relax once the flames are extinguished; even after the fire is out, there’s still damage occurring to your home or business. Soot etches household surfaces like marble and chrome, while toxins released by burning plastics and smoke leech into textiles and furnishings that weren’t in the initial blaze. Even the byproducts from fighting the fire can leave their impact, so be sure a call to ServiceMaster Restoration & Cleaning is one of the first ones you make. We can rebuild elements damaged by the fire, as well as clean and restore personal property. Don’t throw away anything until we’ve had a chance to save it. If you need disaster restoration services in Crosby, TX for any reason, call the highly skilled professionals at ServiceMaster Restoration & Cleaning. We work with insurance companies to expedite your claim and we’ll respond quickly to emergencies of any size, day or night. Call us at (800) 303-5844, 24 hours a day, 7 days a week, for high quality disaster restoration services.